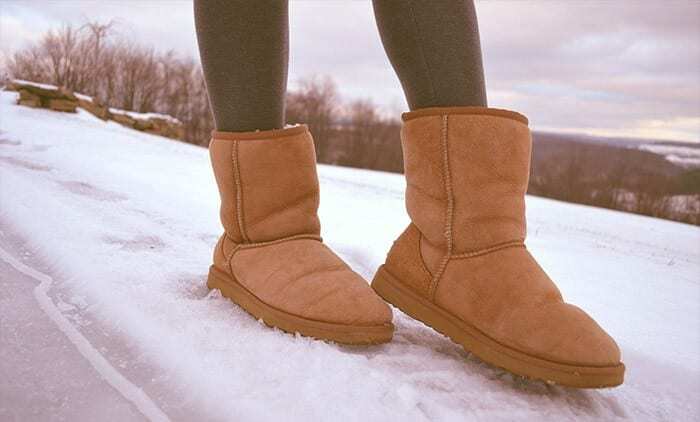 Uggs are famous for making sheepskin boots that have fuzzy, comfortable fleece in the inside. They have been taken from their native Australia and New Zealand to the rest of the world. A culture emerged around Uggs that make people recoil. People think they are “basic,” as many mini-skirt-wearing teens sipping pumpkin spiced drinks have worn them. The other perception is that they are not classy, as people wear them for comfort, by tucking their sweatpants into them. The newest shoe by Ugg, called the Kasen, however, breaks all these stereotypes. Instead of the bulky look that their classic shoes are known for, the newest shoe is classy, and sleeker. It still has the classic stitchings of Uggs, where some of the fleece is visible in straight lines on the outside. The shoe’s biggest change, though, is that they are heels. This new stacked heel comes in two versions- an ankle length boot that can even be worn in warmer weather or a tall boot. Color-wise, there are two choices. The Californian brand stuck with classic Ugg hues of black and chestnut. One of the models who promotes Uggs is Rosie Huntington-Whiteley. This British model has an unbeatable portfolio, as she used to be a Victoria’s Secret Angel, and was the face of the “Burberry Body” perfume. She was seen rocking the low-top, chestnut boots, which matched nicely with the sandy color of her camel coat. The outfit was tied together by some blue jeans. The way that Rosie pulled off the shoes definitely shows that the vision of Ugg’s re-branding has manifested. Now, all we can do is wait and see if people will pay $150 or $250 for the short and long Kasens, respectively. Soon, the perception of Uggs as fuzzy, functional, and basic will potentially be shed, depending on how the Kasen sells.